Red, orange, yellow, green, blue indigo, violet is a popular color scheme. When you can’t choose one or two, use them all in rainbow order. 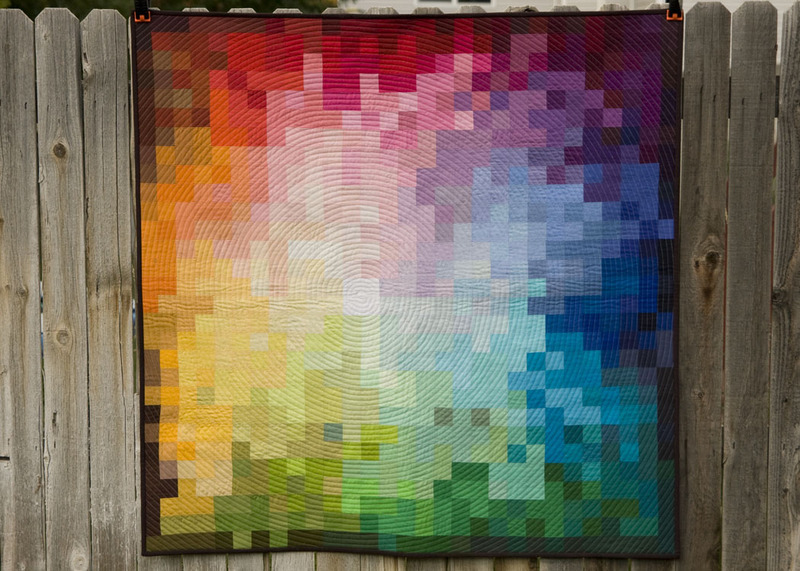 Up first as the featured quilt is Kati Spencer’s stunning Pixelated Colorwheel. Take a few minutes to take in this quilt. Katie shared that she wasn’t seeking perfect transition of one color to the next. She simply wanted to create the overall impression of a colorwheel. The squares in this quilt are 1 ½” finished. There are 841 squares in the quilt. Katie used six Kona solids charm packs, 1 of each colorway except 2 of the bright palette, though not all of those colors found their way into the quilt. There are four squares of white near the center of the quilt where the design begins. She started her quilting at this point as well. Kati tells us, “Modern quilting means so many different things to me. Solids almost always say modern to me. 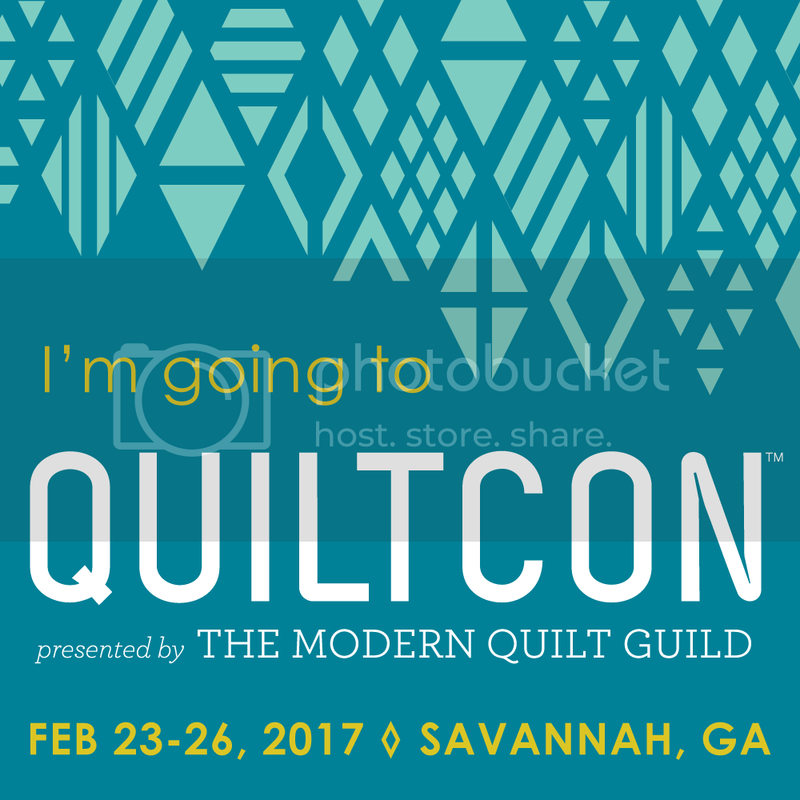 I also think modern quilting frequently has an interesting yet relatively simple overall design.” Kati is a member of the Salt Lake Modern Quilt Guild and blogs at From the Blue Chair. She loves her guild and tells us it’s a great place to learn! Kati’s favorite part of quilting is “seeking out great inspiration and then turning that great inspiration into unique quilts.” She’s definitely inspired us! You can see more of Katie’s work in her Flickr photostream. 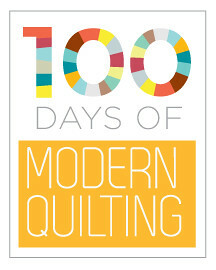 This entry was posted in 100 Days of Modern Quilting, Uncategorized. Bookmark the permalink. Incredible, Kati. Congrats on the feature! Cara @ Me? A Mom? One of my all-time favs. So inspiring. Love this one. Great quilt as the feature. It’s so beyond stunning!! One of my all time favorites as well!!! Absolutely one of my favourite quilts in the history of, like, ever. I LOVE Kati and everything she does! I cannot get over the number of squares or the size of the squares. The result is truly captivating. I love rainbow colored quilts. This is beautiful. Thanks for sharing. I just the way the colors just brighten the way. I am green with envy! Your use of colors is amazing. Thank you for sharing this quilt. LOVE THIS DESIGN. I think this is just what I have been looking for … …LOVE LOVE LOVE.